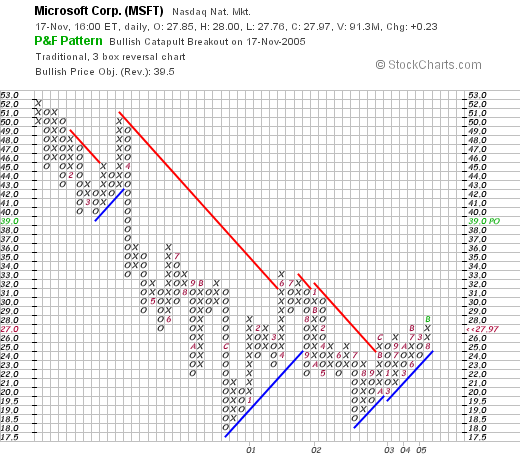 Barron's this weeks suggested a revival in Microsoft stock. And today the stock traded at 28, generating a point & figure buy signal. (I do have a soft spot of P&F charts, after watching so many floor brokers at the Board of Trade follow them back in the 1960s.) Here's the chart from StockCharts.com: Note the price objective of $39 - woo hoo, that would be good. It has certainly been building a nice big bottom for some time now.